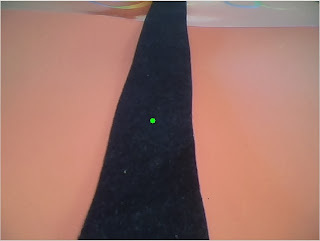 The robot has a new feature, it can follow a black line painted on the floor. 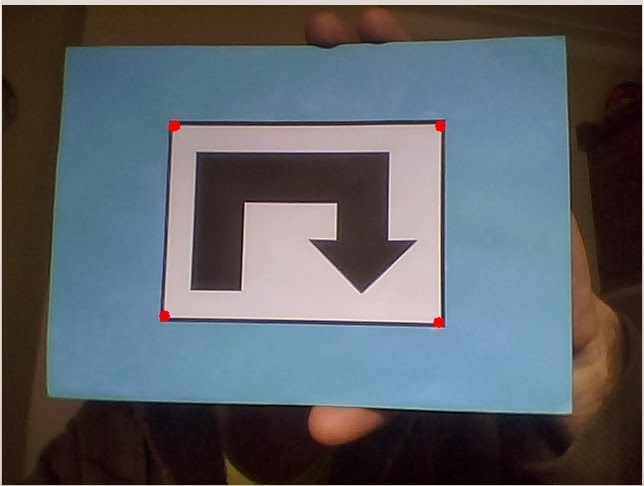 I've created a new sign with a line, when the robot reads this sign it will begin the line following process. 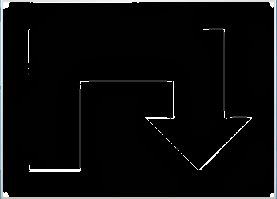 In fact the line following feature is implemented in a very simple way. Because the line is black is easy to isolate from the ground and this is performed using a simple binarization. Here are the steps of the implemented feature. First thing to do is to chose a ROI (region of interest) like showed in the next picture. 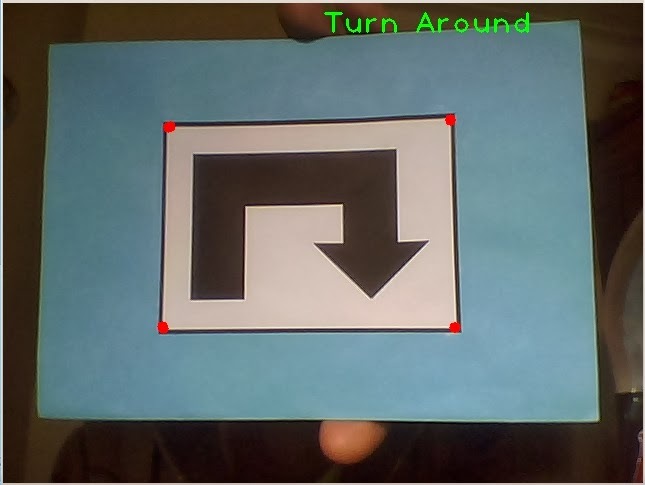 Changing the ROI image (up an down) will change the robot behavior in the corners. If a top region is chosen the robot will turn sooner, otherwise it will turn later. This requires some tuning, it will depend on the robot speed and camera tilt angle. Next step is to find image contours, in this case it will have just one contour (white quadrilateral). After finding image contour is easy to find its center that will be used to turn the robot. If the contour center moves to one side, the robot must turn to follow it. 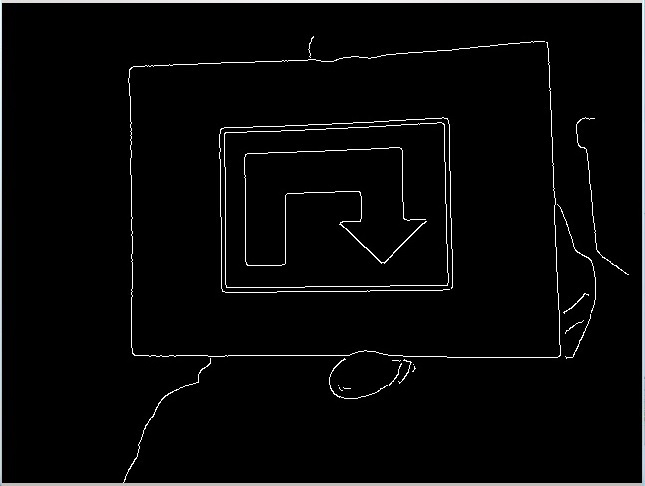 RS4 now can detect and read some signs and perform associated actions. In these videos it follows and reads various signs. First it must locate a sign and move to it, this is performed by following the blue color around around the signs. I'm having issues with color tracking because the AWB keeps changing the image lightning and at the moment I can't turn it off. 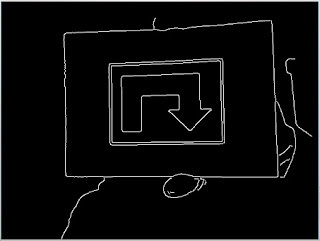 The problem is already exposed in the raspberrypi.org forum and they are working in a solution. All the signs have a black rectangle around them so the next step is to find rectangular shaped contours. 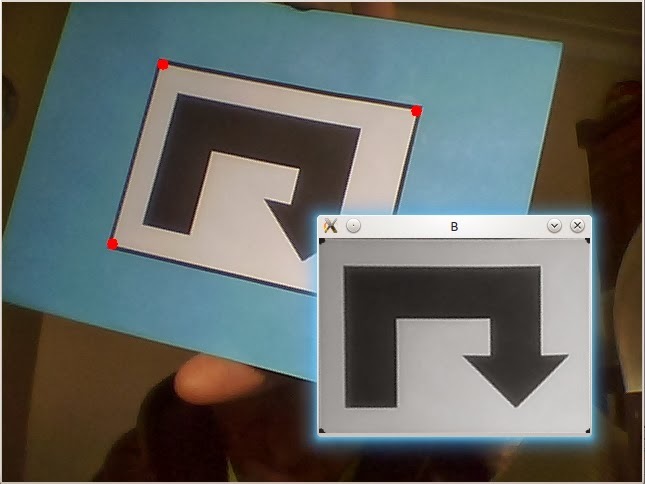 This is performed using approxPolyDP method in OpenCV. At this point found polygons are filtered by number of corners (4 corners) and minimum area. In the next image you can see the result of the process, in "B" is showed the corrected image. After isolate and correct the interest area, the result image is binarized and a comparison is performed with all the reference images to look for a match. At the moment the system has 8 reference images to compare. Comparison is performed using a binary XOR function (bitwise_xor). In the next images is showed the comparison result for match and not match, using countNonZero method is possible to detect the match sign. This methodology works well and it is fast enough to use it in Raspberry Pi. 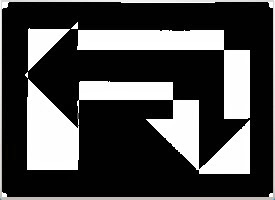 I've tried known methods like SURF and SIFT but are to slow for real time application using Raspberry Pi. Here is the robot that I'm working on, you can see the latest video here, although it suffered some modifications since then. I'll divide this description in topics as it's easier for me to describe it this way. 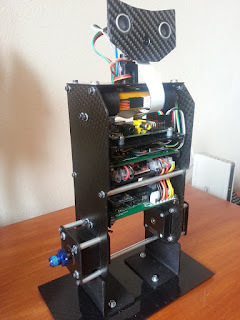 The idea to build this robot came from buying a Raspberry Pi, when I saw it I said "I've got to build a robot with this " :) . 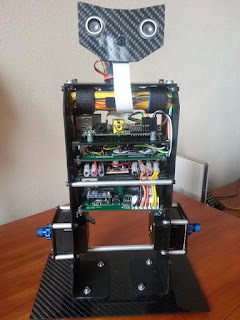 I have built other robots in the past but this one is the most complex and the first with image processing. After this I began the building process, I bought a carbon fiber plate (more or less the size of a A4 sheet) and cut all the pieces by hand with a mini drill machine (unfortunately I don't have a CNC machine to do this job). I bought some aluminum profiles to make spacers and fixing parts as you can see in the next photo. The result is a very light and strong chassis. I'm using stepper motors in this robot, no special reason for that. 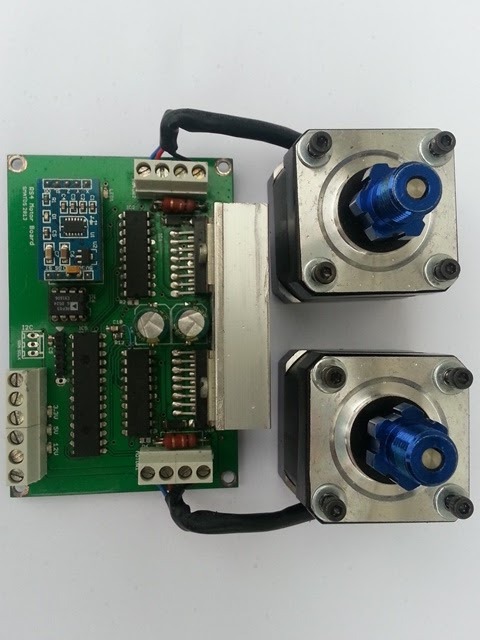 I bought them as Nema 17 motors, the motors reference is LDO-42STH38-1684A 121121﻿ LDO MOTORS. These type of motors have a nice robust look and are usually used in CNC and RepRap machines. 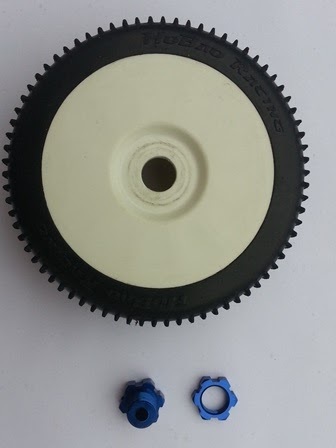 The wheels are from a RC 1/8 Buggy, you can find it easily in any RC store as they are standard size. What I like the most in this wheels is their soft touch, this way they work as a damper for small obstacles allowing smooth run. To connect the wheels to the motors I used Traxxas Revo hubs and nuts like showed in the photo, these are the only ones that I found with a 5 mm hole, the same as the motors shaft. This way is more or less plug and play. For pan and tilt I use 2 micro servos (Tower Pro MG90S), very cheap and easy to get. 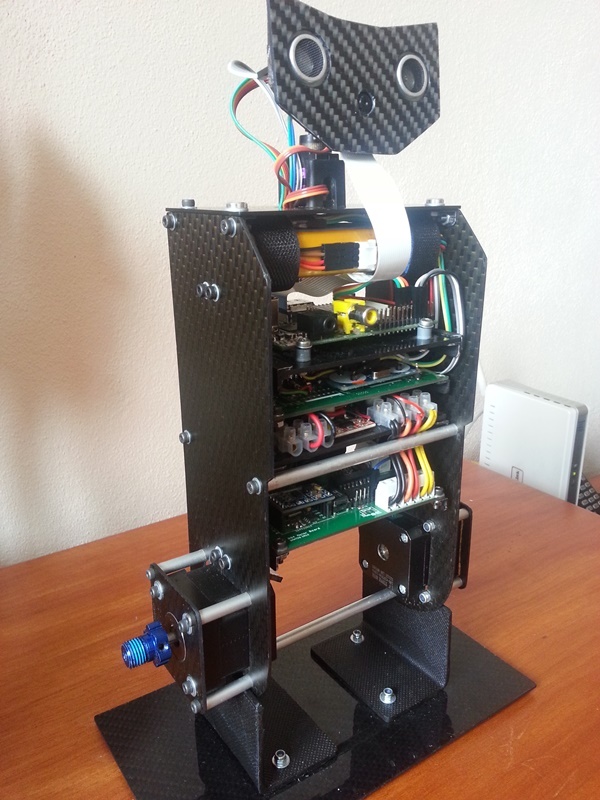 The head has a holder for the Raspberry Pi camera module, a ultrasonic sensor and 2 RGB LEDs. I'm using a modified motor board to control two servos and to read the ultrasonic sensor (not yet being used). This is a temporary solution, I intend to design a dedicated servo control board or buy one. The energy to power the robot comes from a 2000 mAh LiPo 3S battery. To generate required voltages I'm using one 3.3V regulator and two 5V switched regulators. I want to design a dedicated power board in a future revision. Balancing control is performed by a PID cascade, like showed in the next picture. 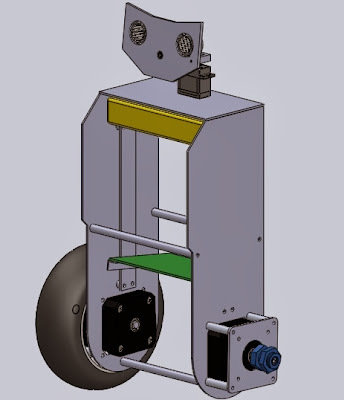 This way is possible to balance the robot even if you move the center mass or run it in a ramp. It will find a new balance angle that allows it to be balanced and stopped. In fact both the controller are PI only, the derivative gain is set to 0 because it causes the robot to shake even with small gain. For PID tuning I used a Bluetooth module which allows me to adjust Kp,Ki,Kd for both the controller in real time. This way you can immediately view the effects and reach the desired behavior for the robot. In this video you can see it successfully balanced for the first time . Sensor fusion (gyroscope + accelerometer to get the leaning angle) is performed by a Kalman filter, not much to say about it, it works really well. Follow this fantastic tutorial, here is everything you need to know, includes explanation and implementation. If spinSpeed is positive the robot will spin clockwise, other way it will spin counter clockwise. That’s the way I found to control the robot motion, there are possibly other methods. Other important thing is that with stepper motors you shouldn't apply big speed changes abruptly or they will slip, this can be solved with some low pass filter applied to factorL/R and spinSpeed. This way works well in my robot. In this video you can see the a run with Bluetooth control, it can run faster than this but will easily fall if it finds some small bumps on the road. At the moment I'm using serial communication between the Raspberry and the motor board and servo control board but I intend to use I2C as it is a more appropriated method. The reason I'm using serial now is because the interface code was already done for the Bluetooth module (it is a cheap serial Bluetooth module). I have to spend some time working in the I2C interface. Serial interface with the Raspberry is quite easy, you just have to disable terminal emulation. I'm using WiringPi library to achieve serial communication and to control Pi's GPIOS without any issues. It works well but is sensitive to lightning changes, at this moment I'm using YCrCb color space instead of the HSV but the results are similar. With the object coordinates in the screen I control the servos to point the camera to the object and control the robot direction based on the head angle. The ball following was the first simple example to integrate all the parts of the robot, the robot behavior was funny and I decided to publish the video on youtube. 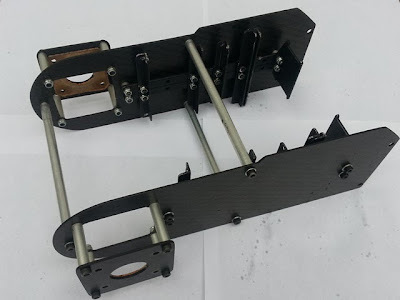 This robot is an ongoing project, I'm continuously building new parts and modifying others. I don't have a defined goal for this robot, I would like to give it some autonomous navigating capabilities. It has some real potential I just have to work on image processing and learn some more technics. I intend to add a speaker too. In the initial robot sketch it has 2 arms, it would look cool but it gives a lot of work to build and I'm aware that is hard to give it some useful function like grabbing objects or something. I could use arms to get the robot back on balance after a fall, maybe in a future update. I have implemented odometry in this robot, at the moment I'm not using it. A 3 axis gyro would be very useful to correct odometry angle errors, a point to review in future revision.